People in remote Australia need your help right now. Many of them have suffered through years of continuous drought. But just as their hearts were filling with hope, just as people around the country rallied behind them, they were dealt another terrible blow. This year, devastating bush fires and floods ravaged their communities. Many have lost their homes and livelihoods. I’m afraid for some, this may be the last straw. But we are working hard to be part of the solution through our network of Bush Chaplains, who are currently providing emergency relief and pastoral care to those dealing with grief and trauma. Some of our volunteers are already on the ground providing support where possible and getting ready to help with clean up efforts. The call for us is great and it’s only getting bigger. A gift of $30 or $50 will ensure our Bush Chaplains and volunteers are resourced and ready to go where they’re needed most. February floods in north west Queensland cutting off road access. Rev David Ellis of our McKay Remote Area in north west Queensland, recently told me about the devastation in the region. Cloncurry and surrounds went from 43 consecutive days of plus-40-degree temperatures to a monsoon that dropped more than their average annual rainfall in just eight days. The extreme temperature fluctuations and wide-spread floods in the region killed much of the little surviving stock that already-struggling farmers had. For David and his wife Janette, people’s immediate safety and welfare are at the centre of everything they do. Right now, they are on the phones daily, visiting properties where access is available, checking in to make sure everyone is ok and working with other services to provide assistance. Top: From the air – if you look closely, you can see a pile of dead cattle. They died huddled together, trying to keep warm. 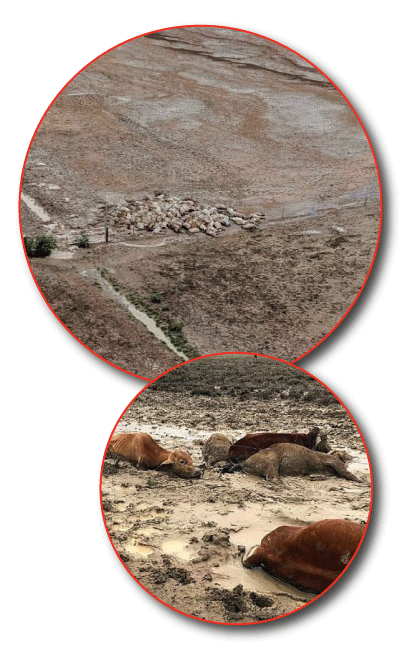 Above: On the ground – cattle dying due to exposure to extreme temperatures. David and our other Bush Chaplains across remote Australia need your support more than ever. You can keep them on the road, connecting with people and providing pastoral care to those affected by disaster by giving a gift of $30, $50 or a generous $100 today. 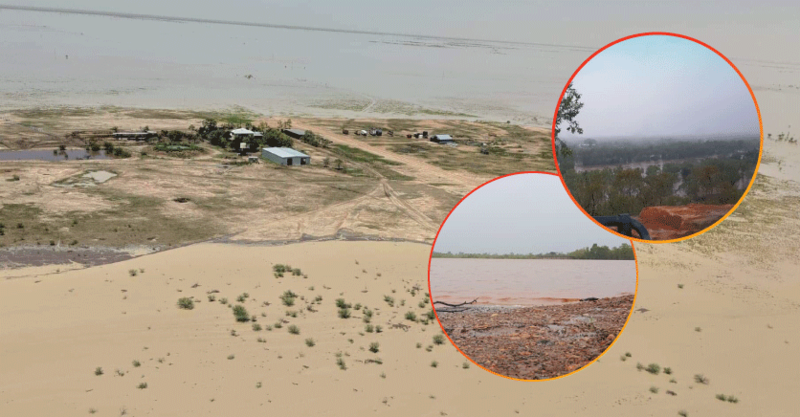 One of our farmers, Kaye* recently spoke with me about the floods in north west Queensland. She and her husband were visiting her mother’s property in Julia Creek, just east of Cloncurry. Kaye spoke of the devastation she saw when she got up on the helicopter. Ninety percent of their stock was dead. What overwhelms Kaye and many of our farmers is how they’re going to recover. Losing stock was stressful enough. But their home, farming vehicles and equipment have also been damaged by the floods. Now more than ever our farmers need people to give them a helping hand. In the coming months, our farmers will need a workforce to help with clean up and recovery efforts. A gift of $30, $50 or $100 will greatly help to mobilise our volunteers and resource them so they’re ready to go as soon as access to these affected areas return. Donate NOW to mobilise our volunteers and resource them so they're ready to go! Right across much of disaster-affected remote Australia, we are working closely with our Bush Chaplains to understand the needs of their communities and how we can be of service. They are on the frontline. They know the people and the land better than anyone from the cities. There’s no rebuilding yet, but we know people will need to replace their homes. There will be fences to mend as well as dams, pipelines and troughs to fix. We are waiting for floodwaters to subside and roads to re-open so we can deploy our volunteers. Your support today will greatly resource our Outback Links volunteering program as we coordinate recovery efforts. And it will keep our Bush Chaplains on the road, providing practical and pastoral care to people in isolation dealing with grief and trauma. 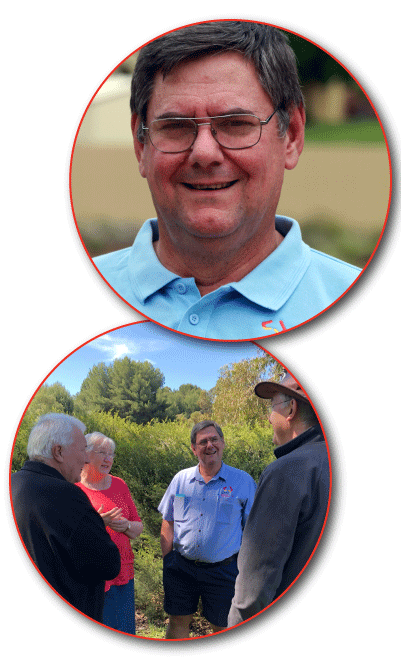 We need to raise $150,000 right now so our volunteers can give farmers like Kaye a helping hand, and Bush Chaplains like David can continue bringing hope to people in isolation struggling with the aftermath. With a gift of $30, $50 or a generous $100 today, you can make a real difference to the lives of our Outback brothers and sisters. With your support, together, I know we can see them through.